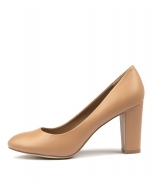 A comfortable pump is essential in every woman's wardrobe. This classic design has a padded footbed that offers shock absorption and a wearable heel that provides a flattering fit. A great option to pair with officewear and formal looks, you'll want to wear this style again and again!